I was trying to run ANT to migrate code between two Salesforce orgs today and realized I hadn't configured the Force.com Migration Tool properly for my new Mac. I kept getting the error; [antlib:com.salesforce] Could not load definitions from resource com/salesforce/antlib.xml. It could not be found. I already had the latest version of Eclipse installed, which handles the Ant installation for you. You can confirm this by typing ANT-version in Terminal. So, it was just a question of getting the migration tool in the Ant lib directory. (This took me a bit of searching hence this quick post). Download the Force.com Migration Tool (instructions here). Now you're good to go. Check out Jeff Douglas' blog post on the hows and whys of this tool. My recent infatuation with all things Mac has been taken to new levels since I was able to convince my IT department to replace my crappy Dell with a shiny new Macbook Pro. Hot! Now 80% of my work on any given day is 'in the cloud' developing for Salesforce.com using a browser, so I wasn't overly concerned with the transition. That being said there is still some software that I depend on.So I decided to post a list of the Mac equivalents for other Salesforce Developers using OSX. 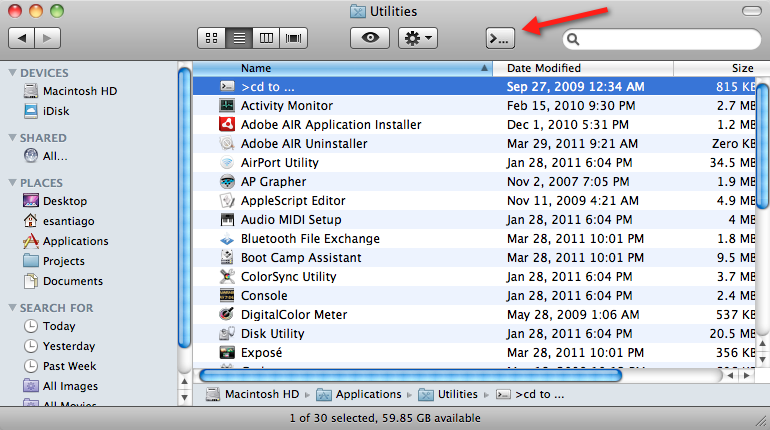 Apex Explorer for Windows = SoqlX Explorer for OSX – Another gift from Simon Fell. It actually is better than the official release. Outlook Connect for Salesforce = Maildrop for Mac OS – Perfect match to Entourage. Again, from you know who. Eclipse IDE Win32 = Eclipse IDE MacOS – Install the Mac version of this open source IDE and then follow the instructions for adding Force.com to Eclipse. Psst. Look at the screenshots. 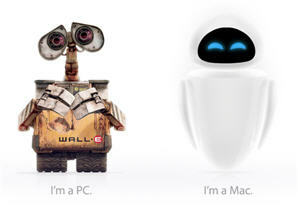 Its a Mac. Probably Simon Fell's Mac. So what didn't make the cut? Force.com Excel Connector – In my opinion, a superior tool to the Data Loader for the purpose of quickly querying and updating Salesforce records. I used it extensively for cleaning up data during migrations. Alas, the geniuses at Redmond decided not to support VB Macros in Excel 2008 for Mac. Seriously? Why would you release a product on one platform that is missing a major piece of functionality readily available on the other. Oh, maybe you're trying to build a monopoly and undercut use of the other platform. Ok, then. Nevermind. This may have been a non starter anyway since the Connector relies on the Office Toolkit which is only for Windows. Tried the Mac version of Mass Update Anything, but the UI is all screwed up. Looks like the version is from 2007, so it might not be compatible with Leopard. Notepad++ – Using TextWrangler but not loving it. Might try TextMate. SnagIt and Camtasia – I make a lot of screen captures and videos for training. Using Snap Pro X because that was recommended by my IT dept, but it feels like a downgrade. It doesn't have an editor for adding callouts, screen zooms, etc. Might try the Mac beta of SnagIt and see if I can make a case for Camtasia for Mac. So after being able to successfully load Mac OSX on "my" MSI Wind U120-024US, I had to take inventory and see what did and did not make the transition. First order of business was to upgrade the Bios from .10C to .10F. MSI does a great job of getting you lost on its website. (I suspect Engrish may not be the native language of the web team. ) In any case, I finally tracked down the latest bios and , even better, the user manual . This post gave very clear instructions on updating the 120 Bios. Creating the bootable USB drive for DOS was simple enough having had practice creating several by this point. I copied over the three files from the download and rebooted the Wind. On my first attempt I got "ERROR: Bios has no flash information available". According to MSI's FAQs that error is asking you to plug in the power cord. Because an message reading, "Please plug in the power cord" would be confusing. I did that and it worked on the second pass. Well, I solved that mishap by hitting the "any" key (A 'lil tech support humor here. This is as funny as it gets, folks.) during the darwin boot screen, entering -x at the boot options prompt. This got me into safe mode and I was able to delete the ktexts I had installed and then restore the originals which had been given a .orig suffix. That's two hours of my life I won't get back. Take two; I was able to find a package with all the relevant drivers for 10.5.7 on this post. Again I pressed my luck and decided to select the options for Realtek Ethernet and the Trackpad despite some allusions to issues by both the author and several posts. Living on the edge here. After getting caught in an endless reboot cycle, I realized that might not have been a good idea. Safe mode didn't work this time. So I booted into single user mode using the -s option at the Darwin prompt. Then I used the instructions here to delete the RealtekR1000.kext. If you get the read-only error like I did use the mount -rw -a command suggested in the first comment of that thread. Take two point five; Ok booted successfully again. Now time to review the update items and see what does/does not work. Video – Booted to 800 x 600 but a quick check of the display pref pane showed options for 1024 x 800. Awesome. Network – Wireless still worked from my previous install. The Realtek RTL8187SE wireless drivers are also included in the MSi WindOSX86 Upgrade Pack v1.5. The wireless app pops up on every boot which is annoying. I used the Auto-Close for Realtek app suggested on the OS X post install tweaks and fixes post and that seems to have resolved that. As mentioned previously, Ethernet driver was a total bust. It turns out that the first driver package installed the RealtekR1000.kext driver to the location /System/Library/Extensions/IONetworkingFamily.kext/Contents/PlugIns/ which is for a retail install. The correct location is /System/Library/Extensions/. So essentially I had the same driver in two seperate locations. Booting into single user mode and deleting the first one fixed the errors and got the ethernet working perfectly. More details in this post. Battery – The guage appears on the toolbar as expected. Calculates percentage and time albeit slowly. Fully charged with a 6-cell battery estimate was 3:50 battery life. I tried the VoodooPower app suggested on the aforementioned post and didn't see any significant change right away. However after comming out a sleep mode the battery guage showed 5:30. That's almost too good to be true. I left it on for a while and noticed issues with hiberate and random reboot requests. Went into single user mode and deleted the kext. Sleep mode – Closing the lid puts the notebook into sleep instantly and hitting the power button brings it back just as quickly which is where my Windows laptop falls woefully short. Camera – Need to hit Fn + F6 to turn it on. Had no luck with CamTwist. ManyCam worked like a charm with Skype. You have to set ManyCam to start on boot and set the camera in Skype preferences to ManyCam after it loads. Trackpad -Worked fine after running the 1.5 upgrade pack. I decided to try installing Two-Finger scrolling but the mouse was nearly unusable afterwards. It did scroll, but only down and not up and even that took pressing rather hard. The cursor twitched and jumped all over the place. I made some attempts to use the FFscroll pref pane to tweak the settings (hard to do with a disfunctional mouse) but it never seemed to save the changes and half the time would not open at all. I'll leave that to braver souls than I. Key Mapping – I wanted to use the windows key as the command key. System Preferences > Keyboard & Mouse > Modifier Keys. 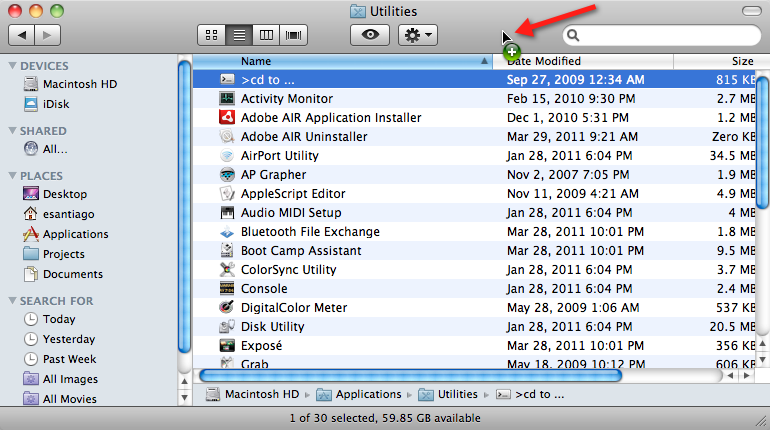 Changed Option Key to map to Command and Command Key to map to Option. Now I can Windows + C to copy and Windows + V to paste. Maybe I'll find a little sticker to label the key better. Bluetooth – I don't know if this even comes with my model nor do I have anything to test it with. Final Impressions: Getting this Mac clone set up took quite a bit more effort than I originally anticipated. Ironically, all this command line bios-changing driver error fixing blue screening reminded me of setting up a Windows machine. Which was not necessarily a bad thing. I learned quite a bit more about the Mac OS. I think with today's computers being much more like sealed devices, people learn less about what is under the hood and make these things work. I remember when my dad bought one of the first PC's. We turned it on and the screen blinked a cursor at you. It took my brother and I days to get just DOS running. These days computers are like cars; everyone knows how to drive, but they pay some guy big bucks just cause he knows how to change the wiper fluid. Not that I mind. I'm complaining all the way to the bank. My girlfriend got a shiny white MacBook several months ago and I’ve been seriously sweating it. (I’m borrowing it right now) For one, it turns on in the time it take my crappy laptop to inform me that its from Dell. Don’t get me started on trying to get XP to hibernate/sleep. I just leave it on 24/7 to save myself 30 minutes of “Loading…” hell each morning. So when she decided to get a Netbook for her monthlong stay in South Africa, I jumped at the chance to make a mini mac clone. So I ‘persuaded’ her to buy a MSI Wind 120 after doing some Google research which cited that as one of the models well-suited for ‘hack-a-mac’. Working in the SAaS sphere for a few years now, I haven’t done the whole fdisk, bios, etc thing in a while. Luckily there were a lot of posts on the MSI Forums to help. OK the last step took me quite a while. Most forums mentioned the Chameleon DMG and direct you to the Developers site. But all I could find was the source code for the latest stable version 1.0.11 not the compiled package. I tried the 2.0 RC1 package but it kept stalling at the message “Writing Package Receipt. 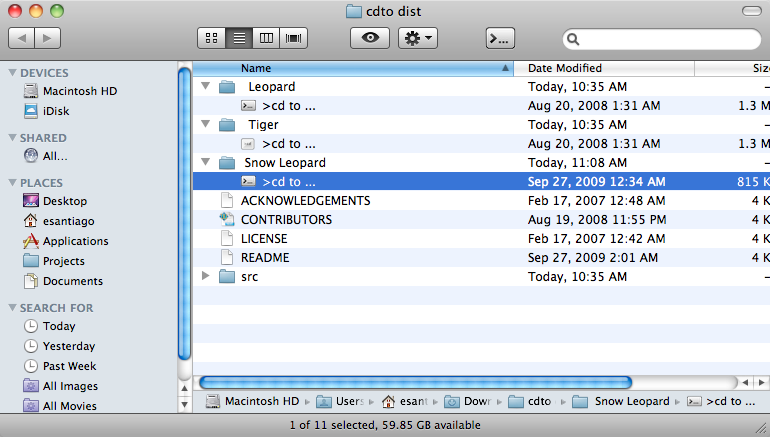 It took some searching to finally find a copy at FilesTube; Chameleon-1.0.11-installer.dmg. bootable.Make sure to change the target because it will default to your Mac’s harddrive. Now you need to prep the MSI Wind. I didn’t want to delete the recovery or windows partitions in case things went south. Luckily the Wind came with three partitions, recovery, OS_Install, and a third empty partition. I ended up creating a Ubuntu live bootable from a spare 1GB drive following the suggestion on this post; http://forums.msiwind.net/viewtopic.php?f=32&t=4701 and then deleting the third partition. I tried going through the next step leaving the space unpartitioned, but I couldn’t get past the select a destination step in the Mac OS installer. So I went back and created and unformatted primary partition. Close the disk utility. You should now have a new partition without the red mark and that you can select. Run the install. It should take a few minutes and reboot your Wind automatically. All 3 partitions will show in darwin bootloader, with osx the default. Success!! My wind booted to Mac OSX with the gloriously satisfying intro movie. The next steps are to make sure everything works. Already I’m seeing some issues with the wi-fi. I’ll post more as I figure it all out.